Lambasting reality, American art-metallurgists deliver uneven symphony of a pocket kind. Although this album’s title and artwork suggest humorous take on life, what the two Californians behind it offer on their sophomore record – separated from the first one by a 7-year streak – is rather serious. Shaped as a radio programme of sorts, the record struggles to marry light entertainment to dark matter, while blinding the listener with the players’ prowess: a typical foible of prog rock – the genre obsessed with serving up clever music and sacrificing melody in favor of cerebral tinsel. There’s a valiant attempt to escape such a trap on “Mr. 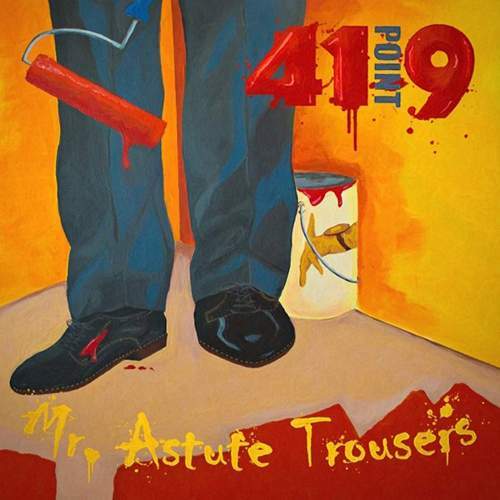 Astute Trousers” but the duo are at their best when simple feelings take over the quixotic urge to impress. That’s why the intense, yet lyrical, instrumental “Tilting At Windmills” or the intimacy-promoting, scintillating rifferama of “Confessions At Midnight” taste much better than topical pieces that repulse eternity to scold today’s ills. There’s nice groove under “For The King” which singer Brian Cline’s raving guitar and Bob Madsen’s massive bass take from a dirge to Valhalla-like bliss only to resolve the resulting tension in keyboard-led cinematic bombast, possibly to illustrate a “soulless machine” they aim their anger at; and the angrier they get, as a charity-benefiting drama “The Marine” demonstrates, the harder it is to relate to the music. Once a metal veneer of “The Black Line” gets shattered to reveal the track’s acoustic lining, the band’s bleeding heart is laid bare for all to see, with “These Four Lands” forming a funky fantasy, while “Don’t Cut Down The Rose” adds an AOR sensibility to the sax-enhanced flow. “Familiar Strangers” wraps its heat in bossa nova rhythm and pedal steel, but it’s the Celtic tune running through “Big Data” and streaming, on an orchestral tide, into “The Loch” that must define the ensemble’s further explorations. Otherwise, they’re doomed to remain in their trouser pocket.